We’ve been attending and hosting a lot of BBQ’s this summer. I am not complaining, I love eating outside with friends, family, and good food. Josh and I usually eat outside on our patio, even when we don’t have company. It’s hard to stay inside when the weather is so nice. 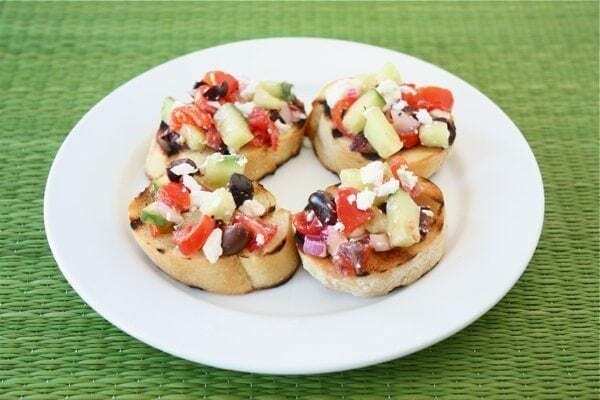 Utah is hot, but luckily it cools down in the evenings:) One of my favorite appetizers to make for summer parties is this Greek Salad Bruschetta. It is easy, fresh, and a great way to use up garden cucumbers and tomatoes. To make the bruschetta, I cut a French baguette into slices. You can toast the bread in the oven or on the grill. We already had the grill on and I didn’t want to heat up the house, so Josh grilled the baguette slices. Plus, I like the slight smoky flavor the grill adds to the bread. The Greek bruschetta topping is easy to make. Dice up tomatoes, cucumbers, kalamata olives, and red onion. Stir the ingredients together with red wine vinegar, feta cheese, and season with a dash of oregano, salt, and pepper. Top the baguette slices with the Greek salad topping and serve. Put your garden cucumbers and tomatoes to good use this summer and make this Greek Salad Bruschetta. This easy appetizer is perfect for any summer barbeque or party. It also makes a great healthy snack or light lunch. 1. To grill the baguette slices: Preheat grill to medium-high heat. Place baguette slices directly on a grill and grill for 2-3 minutes, or until slices have grill marks. To toast the baguette slices in the oven: Preheat oven to 400 degrees F. Place baguette slices on a baking sheet. Bake for 7-10 minutes, or until baguette slices are golden brown and toasted. 2. 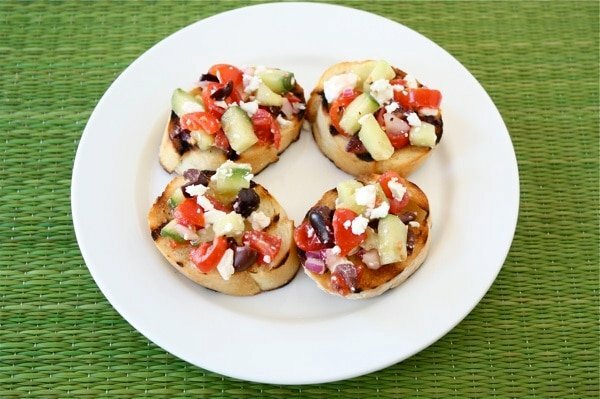 To make the Greek Salad Bruschetta topping: In a medium bowl, diced tomatoes, cucumbers, kalamata olives, and red onion. Add red wine vinegar and feta cheese. Stir until well combined. Season with oregano, salt and pepper. 3. Top baguette slices with bruschetta topping. Serve immediately. And your photos today on Instagram..holy moly woman. Arent you supposed to be pregnant, resting, and taking it easy? Your spread/feast/food looked….AMAZING! In my face, now please. A nice twist on bruschetta. Perfect for summer get togethers. 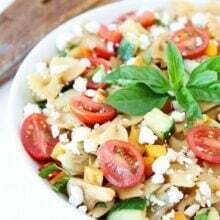 I’ve been on a huge Greek kick lately (salads, pasta salads, burgers) and I recently did a bruschetta like this! Perfect little bites of deliciousness 🙂 Great recipe! I love anything greek . I love bruschetta more! this is a perfect recipe in my book! 🙂 I love that you grilled your baguette, i bet the flavor was amazing! This is perfect for those hot summer days. I love the idea of grilling the bread. This looks so flavorful! I enjoy eating outside too. The SoCal weather fortunately gives me this opportunity quite often. I am loving these flavors and would love to make this!! Thanks for the great recipe. 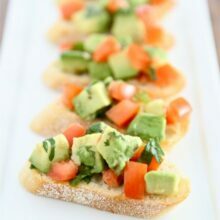 I love bruschetta and this recipe looks fantastic. This sounds amazing. I can’t wait to make them. We’ve been having lots of barbeque’s here too! Love this app. So fun and easy and delicious and summery. Looks like we were both thinking Greek! Thx for the link love! Looks good, especially with the grilled bread! 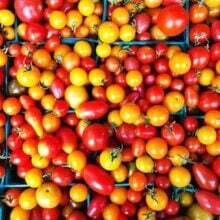 These look great – so light and fresh for summer! Love all of these flavors together, what a great appetizer! I absolutely LOVE this idea!! Can’t wait to make this for an upcoming party! I love greek flavors! and on Bruschetta? How smart and delicious! Wow! 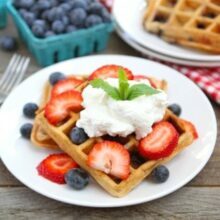 These look totally delish! I have a ton of cucumbers in my life right now and absolutely no plans for them…until now! This bruschetta sounds delicious! These look like the perfect summer part appetizer! This looks like a fantastic appetizer! Have a great weekend. I love making Bruschetta. They are quick to make .. easy to prep and you can always add your own twist. This looks so pretty – I just had something similar to this topping as a salad for dinner, with bell peppers too. As you mention, this is a great way to use all the tomatoes and cucumbers that are in season. that looks fantastic! i HEART Greek Salads! I make my own at least once a week! I will have to figure out a better sub for tomato though, not a huge fan here, maybe artichoke hearts….YUM! thanks for the GREAT idea! this is my kinda meal – bright, fresh, light and the veggies are perfect this time of year! I love this idea! I’m always making the Italian version of bruschetta, but I love the Greek variation. Very creative! Utah is perfect in the evenings 🙂 Loving this bruschetta…so fresh and yummy! yum! this is just what I need after two weeks in Greece.. more mediterranean food! you just can’t beat it. Any appetizer that doesn’t require turning on the oven is a good one in my books! Great looking dish. boy does that look great! 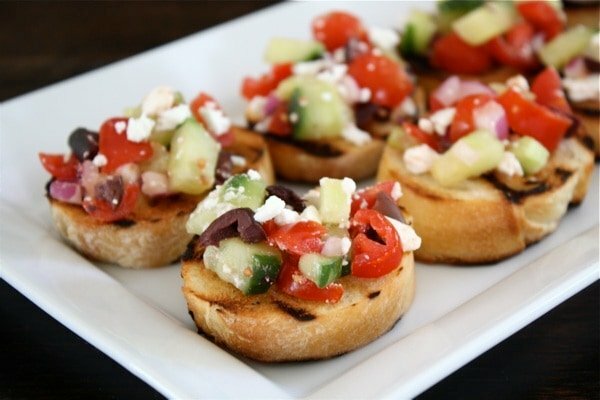 I love Greek food and Bruschetta.. i never thought of mixing them! Thanks! This recipe looks delicious. The ingredients are so fresh and the flavors sound so good together. Ok this is my new favorite site. First I made your Twix brownies and now I have to make this bruschetta recipe too. Great ideas!!! This sounds amazing! Yummy recipe. hey, I think I could do a riff on this to use up some leftovers. thanks!! I love greek flavors…I could go for this for dinner tonight 🙂 Love the twist on the usual bruschetta! These look amazing. I want one of them right now. Wow. I just took these to a party and people LOVED them! Thank you!